PTIS gears up for a Picnic in the Park! The 'Flames of Paris' is performed here by Chiang Mai Ballet Academy students, Challes Del Veggio and Merumi Nishimori. 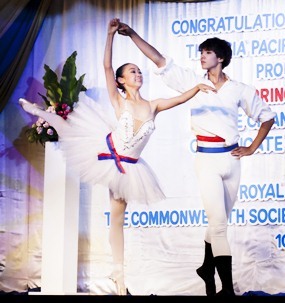 His Serene Highness Prince Ticomporn Yugala graciously presided over the Congratulation Ceremony for the Chiang Mai Ballet Academy’s students who won awards from the Asia Pacific Dance competition in Singapore. The event also marked the Academy’s certificate commencement awarded by world renowned organizations the Royal Academy of Dance, UK, and the Commonwealth Society of Teachers of Dancing, Australia. The ceremony was held at the Empress Hotel in Chiang Mai on October, Sunday, 10, 2010. 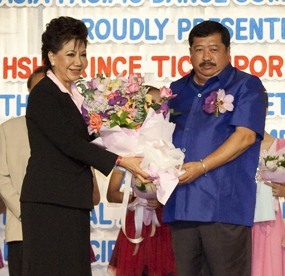 HRS Prince Ticomporn Yugala, right, is with Mom Luang Preeyapun Sridhavat, left, the Director of the Chiang Mai Ballet Academy, and also the Honorary Consul of the Republic of Peru in Chiang Mai with a congratulatory bouquet of flowers at the event. Ms Bovornrat Maneerat performs onstage for the event. 8 of the student dancers present “Circus” to the audience. As the rains begin to clear in exchange for cool winter sunshine, PTIS is looking forward to hosting its eagerly-anticipated annual International Day. 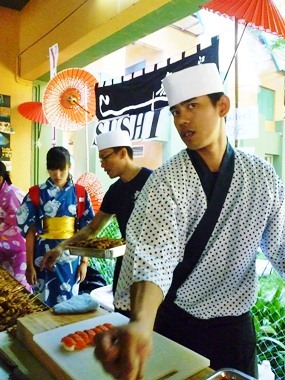 Sushi was a big hit at last year’s International day. Each year the day is given a different theme to help steer the various events, shows and stalls which provide the entertainment to the many guests who flock through the front gates. Last year the theme was ‘Dance Around the World’ and guests were treated to a great variety of routines from almost every corner of the globe, with performances by teachers, students and parents showcasing their national dances. This year the event will be taking a slightly different approach as the theme will be ‘Picnic in the Park’ which sees a venue change from the school grounds, to the Triadhos Three-Generation cricket field. The new location offers extra space for guests to relax, play and enjoy the great wealth of items on offer. This year entertainment will be provided by performers on the live stage, various games stalls such as a coconut shy and penalty shootout, as well as many other stalls offering different varieties of food from all around the world. The event will be taking place at PTIS International School on Saturday 6 November 10.30 am - 4.00 pm and entry is free. The Yonok Foundaton received support Khun Boonkrong Indushophon, a renowne philatelist, or stamp collector, who was honored as a signatory in the Roll of Distinguished Philatelists 2001 by the Philatelic Congress of Great Britain for her outstanding role in the philatelic community. She is supporting the Foundation’s reading and writing campaign by establishing the Prakaipet-Boonkrong Indusophon Writing Award to celebrate International Letter Writing Week 2010. The award was named after Khun Boonkrong and her husband who are both recognized internationally for their expertise, talents and outstanding studies and research in the philatelic sphere through their stamp collections and in their writings. Dr. Nirund Jivasantikarn, Chairman of Yonok Foundation and also Chairman of Lampang Reading Commission, says that the mission of the project is to promote reading and writing. It aims to inspire, motivate and encourage people in Lampang to read more and to write more, especially letter writing which has become less popular nowadays. Khun Boonkrong will come to Lampang to hand out the award to the winners and to meet with young philatelist of Lampang. On October 22nd, the Chiang Mai Toy Ride paid a visit to Wat Prachakasam School where they have already managed to install fresh water tanks and filters. The riders donated school supplies, band and sports equipment. The highlight for the kids was, of course, the toys that were handed out as the ToyRide believes that fun is as important as school. The next Chiang Mai ToyRide is scheduled for February 20, 2011. As well as their annual Christmas Eve visit to Maharaj Hospital Children’s ward. [email protected] or visit their site for more information http://www.chiangmaitoyride.com/.